What is a Dojo? The word Dojo means training hall . For example, the White Wings Dojo view is a spacious facility, with a padded training mat, separate dressing rooms and bathrooms, and a small office. What does Sensei mean? Sensei is an honorific title meaning teacher . The head of a dojo is always referred to as Sensei, and other instructors as well. O-Sensei means great teacher. 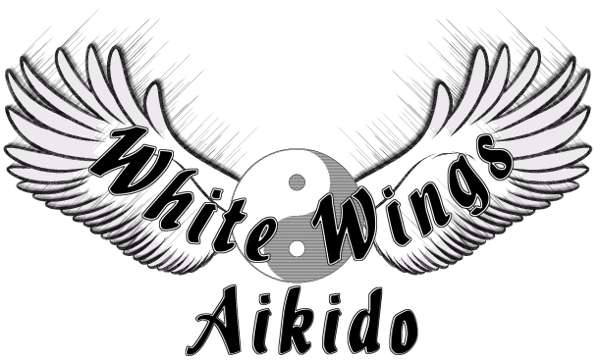 In Aikido this refers to Ueshiba Sensei, the Founder of Aikido. How do we train? Aikido training consists of throws and falls. A class session generally works on between 3 and 5 different throws. Each person chooses a partner for a given throw. The partners take turns throwing each other four times. The person doing the throwing is called nage. The person doing the falling is called uke. Students find they learn as much from acting as uke as nage. If I'm falling all the time, why don't I fall apart? Students are taught from the first day how to fall safely. This is in fact one of the most important and pleasant aspects of Aikido training. We train on a layer of tumbling mats or tatami. Must I be in good physical condition? As with most martial arts it helps for students of Aikido to be in good physical condition. You will build up your strength and endurance over time at your own pace. Can I be injured? There is some risk from the throws, rolls, etc. in Aikido. However, Aikido emphasizes safety. Each student is taught to be aware his or her own, as well as partner's, ability. How often should I attend class? Students are encouraged to attend classes a minimum of 2 to 3 times a week. However please be aware that you can do as little as one class a month. What can I expect when I begin classes? A ranked person will work with you individually during your first classes to prepare you gradually until you feel ready to train with the group. What do I wear? Most students wear a gi. A sweatsuit or other loosely fitting cloting is acceptable if you do not have a gi. Check with your dojo to see if they are sold there. For the first time no need to have a gi, just come along no special clothing needed. Who are the instructors? Aikido is under the direction of Adrian Young Sensei. He currently teaches three days a week at the White Wings Dojo. Several of the senior students are assigned as instructors to teach classes. Most new students are interested in Aikido for a specific reason. This reason could be self defense or better health or because your friends are doing it or any number of other things. However, learning Aikido is a journey, not a destination. There is an old saying: A journey of a thousand miles begins with the first step. Your first step is to get on the mat for your first class. How do you choose a dojo (an Aikido school)? The best way is to observe a class.